In August 2016, the tenth season of excavations was conducted at Tel Rekhesh (License No. G-72/2016; map ref. 243776/728600). The excavation, undertaken on behalf of Tenri University (Tenri, Japan) and Rikkyo University (Tokyo, Japan) and underwritten by a Grant-in-Aid for Scientific Research of the Japan Society for the Promotion of Science (Kakenhi; A—Subject No. 25257008; B—Subject No. 25300022; C— Subject No. 26370827), was directed by H. Kuwabara (Tenri University), S. Hasegawa (Rikkyo University) and Y. Paz (IAA). The expedition included T. Onozuka, H. Hashimoto and M. Aviam (area supervision), T. Kishida (GPR surveying), N. Yamauchi, H. Tsumoto, H. Odagi, T. Hirakawa, R. Iwamoto, Y. Tatsumi and H. Hino (surveying and photography), S. Miyazaki (registration), Y. Wiener (pottery restoration), A. Genach (aerial photography) and Z. Gal (administration). The excavation was concentrated on the higher mound, within areas that were opened in previous seasons (Figs. 1, 2). Special emphasis was put on the Iron Age IIC architectural complex — apparently an administrative center — the exposure of which was enlarged, and on the Jewish settlement from the early Roman Period. 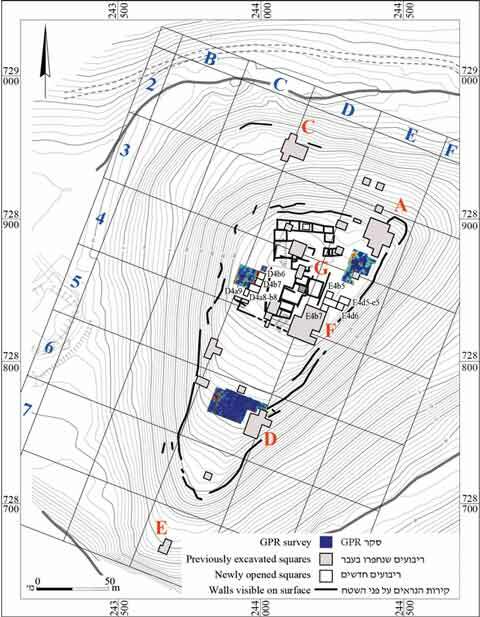 The season’s greatest achievements were completing a plausible reconstructed plan of the Iron Age IIC complex and reaching a better understanding of its date, based on the large amounts of pottery retrieved this season. In addition, two new complexes were discovered: a structure dated to the Late Bronze Age on the eastern edge of the higher mound, and a synagogue dated to the first–second centuries CE at the southwestern side of the higher mound. Another focal point was a sounding dug in the previously undated stepped and plastered installation (Steps 2005; Hasegawa, Kuwabara and Paz 2017), where the finds assured at last an Iron Age date. A large structure and an abutting defense system dating from the Late Bronze Age were unearthed in three squares on the eastern edge of the higher mound (Sqs E4d5–6, E4e5; Fig. 3) to the south of the northeastern gate. These remains were discovered adjacent to the eastern perimeter wall of the Iron Age IIC complex (below). The LB fortification erected along the eastern edge of the mound (Sq E4e5) was found in a poor state of preservation (Paz et al. 2010), as it was mostly eroded and had collapsed down the slope. Its remains in the excavated area comprise a series of eastward-sloping walls (W2552 and W2564 were preserved), built of medium-sized stones. Their general shape resembles a glacis rather than a screen wall, and, considering the extreme steepness of the eastern slope of the mound, they were sufficient to hold back any attack at this point. The structure (Sqs E4d5–6) was probably attached to the fortification, but due to its poor state of preservation the nature of this structure could not be confirmed. An east–west wall (W2541) was discovered at the northern edge of Sq E4d5. Incorporated into the wall’s western end was a rectangular standing stone, whose function is unclear. Two occupation phases were detected in the structure. The earlier was defined by a hard-packed dirt floor (L2556), on which a large, oval, shallow basalt basin was found (L2561; Fig. 4), along with typical LB IIB pottery and a large amount of animal bones. The pottery included storage vessels, triangular-rimmed cooking pots and sherds from imported Cypriote and Mycenaean vessels. It seems that during the later phase, a pavement of small stones (L2550, L2551) was laid abutting W2541. The pottery retrieved from this phase (L2553) seems to date it to the LB IIB as well. However, this assemblage does not include any imported vessels, and the local pottery is characterized, among other things, by ridge-rimmed cooking pots. 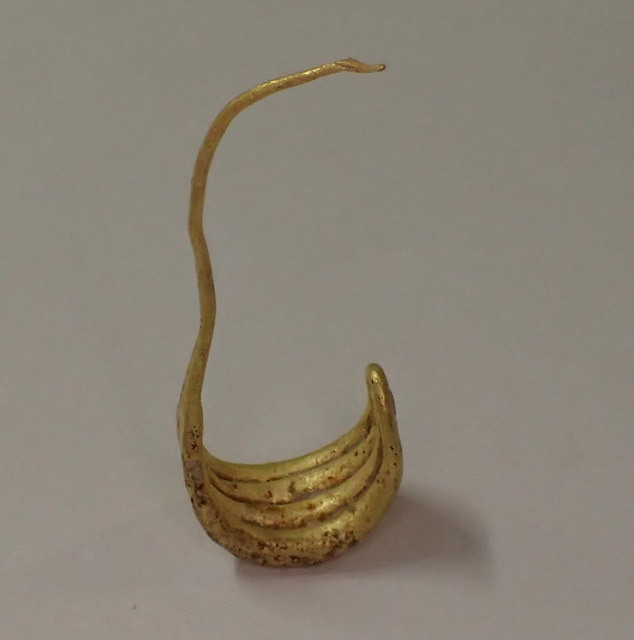 A special find that may be related to this phase is a gold earring delicately decorated with straight lines (Fig. 5). In square E4d6, a basalt basin or mortar (L2547) was detected south of the basalt vessel of the earlier phase. After the use of the later phase of the structure ceased, possibly in the latest days of the Late Bronze Age, what might be a grave was dug into the stone pavement. The rather long duration of this structure, located adjacent to a fortification to the south of the northeastern gate of the higher mound, illustrates the undisrupted urban life at this LB IIB Canaanite town. As it is identified with Anaharath, which according to Egyptian records was captured and plundered by the New Kingdom rulers of the eighteenth dynasty, these finds seem to downplay the Egyptian sources and point to their propagandistic nature. The excavation aimed at exposing additional sections of the Iron Age IIC building complex, apparently a fortress and an administrative center, which is assumed to have occupied a large portion of the higher mound. In hope of exposing additional segments of the outer western wall, as well as the northwestern and the northeastern corners of the complex, a detailed GPR survey was conducted prior the excavation in the southwestern and eastern parts of the mound’s crest. A thorough GPR survey was also conducted along the southern slope of the higher mound. Here, no stone-built architecture was detected along the central part of the slope, but several soundings dug in 2007 along the western edge of the slope bore hints of architecture (Paz et al. 2010). The northeastern corner of the complex was unsuccessfully sought for in the previous three seasons. GPR surveys conducted in 2015 and 2016 did not provide decisive evidence of the corner, but they nevertheless seemed to confirm our assumption that the complex was rectangular in shape, occupied the southern side of the mound’s crest, and did not extend northward, toward the northeastern side of the crest. Eventually, what seems to be part of the eastern enclosing wall of the complex was exposed in Sqs E4b6–7 (W2566; width over 1 m; Fig. 6). Wall 2709 (excavated in 2015; Hasegawa, Kuwabara and Paz 2018), which protrudes c. 3 m to the east, may have been an outer pier, similar to the one we already excavated (W2705). Therefore, we assume that these two walls may define the northeastern corner of the complex. In Sq E4b7—where two spaces, northern and southern, were delineated by Walls 2537, 2538 and 2544—two occupation phases were identified. The earlier phase of occupation was reached in a sounding immediately east to W2544: a floor at 31.21 m asl, which bore Iron Age IIC pottery as well as earlier sherds (Iron II and LB). It seems that during the early phase, an opening in W2537 (L2567; width 1.25 m) enabled access between the northern and southern spaces. This opening was sealed with stones during the later phase of occupation, to which belong hard packed-earth floors (L2546, L2563) in the two spaces; both floors yielded late Iron Age pottery. Up to this season, the thin accumulation covering the complex (up to 1 m depth between topsoil and the lower stone courses) was quite poor in diagnostic pottery. This season, however, finally yielded rather large amounts of diagnostic pottery. The pottery—including a large fragment of an Assyrian-style bowl and numerus mortaria and Iron Age IIC jars and cooking pots—was found in Sq E4b5, outside the complex but close enough to its northeastern corner (L2559) to allow us to securely date the complex on typological grounds to the late seventh–early sixth centuries BCE. The southwestern perimeter. The excavation along the southwestern perimeter of the higher mound aimed at following the course of the outer western wall of the complex, which presumably ran from the southwestern corner, the location of which was already known, northward, toward the northwestern corner. Another important target was to reach floors abutting this wall that could help in dating the complex, as datable finds from contexts that could securely be assigned to the complex were rare up to this season. A detailed GPR survey that preceded the excavation detected the continuation of the outer wall northward from the southwest corner, but not the northwest corner. Seeking to meet these challenges, Sqs D4a8–9 and D4b8–9 were opened to the north of previously excavated squares. Two parallel walls (W151, W2042; Fig. 7) enclosing the complex on the west and running in a general southwest–northeast orientation were unearthed in Sqs D4a8 and D4b8. Wall 151 (width c. 1 m), preserved to a maximum height of 3–4 courses, was constructed on bedrock. Wall 2042, which was constructed in the same manner, canceled an earlier Iron Age II rock-cut installation (L2066; below). In the space between the two walls, along the western perimeter of the complex, a small plastered installation (L2065; c. 1.25 × 1.50 m) was found: a thin plaster surface (31.05 m asl) bounded on the east by a wall (W2064; preserved length 3.8 m) built of one row of stones. The finds collected from the entire space between the two walls comprised mainly Iron Age IIC sherds, along with a Scytho-Iranian trilobate bronze arrowhead and animal bones. A sounding (L2053) beside the eastern face of W151 reached bedrock. The finds from the sounding included a complete Cypro-Phoenician juglet and pottery sherds ranging in date from the Late Bronze Age to the late Iron Age, alongside some Roman-period sherds and a Roman coin. The Roman finds are not surprising since the northern part of the Iron Age IIC complex was completely destroyed by Roman-period construction activity. This can be seen in Sq D4b8, where the continuation of W2042 was cut by the southern wall of the synagogue (below). Installation 2066, which was annulled by the construction of W2042, was unearthed to the east of the wall (Sq D4b9), within the inner space of the complex. The rock-cut installation may have been a wine press. It consisted of a shallow, rectangular treading floor sloping gently southward into a natural rock cavity, which may have served as a collecting vat. The installation was found full of restorable Iron Age IIA–IIC pottery, including three almost complete cooking pots and a complete dipper juglet. A thick surface of packed earth covered the installation (30.56–30.81 m asl). On top of this surface and within it were Iron Age IIC pottery sherds, most of them belonging to storage jars; these should be related to the building complex. The Plastered Stepped Installation. A sounding was dug in the impressive stepped and plastered installation (L2005; Hasegawa, Kuwabara and Paz 2017; Hasegawa, Kuwabara and Paz 2018). As the date of the installation was unclear, two main dates were suggested: the Iron Age IIC (in accordance with the stratigraphy) and the Roman period (judging by the pottery found on top of the installation). To reach a more conclusive dating, a sounding (1 × 1 m, depth c. 0.2 m) was opened in an untouched part of the installation. The pottery collected beneath the plaster provided unequivocal results: not a single Roman-period sherd was detected, while plenty of Iron Age sherds were retrieved. The Iron Age date of the installation accords well with the Iron Age IIC building complex and a plastered bath in the southeastern room of the complex. Plastered installations of this type are one of the characteristics of Assyrian/Babylonian administrative complexes (see, e.g., the Assyrian residency at Tel Ashdod; Kogan-Zehavi 2006). The discovery of what seems to be the northeastern corner of the Iron Age administrative complex allows us to reconstruct the complex as a rectangular structure, c. 35 × 60 m in size. Furthermore, the pottery found in relation to the complex has furnished us with clean contexts that affirm a late Iron Age date (late seventh–early sixth centuries BCE) for the construction and early use of the complex. The ceremonial parts of the complex seem to have included large reception halls and probably a plastered installation. One of the most important discoveries made in 2016 was an impressive structure, uncovered in Sqs D4b6–7 while searching for the northwestern corner of the Iron Age IIC complex. The Iron Age walls were cut by a rectangular structure; its western part was fully excavated (Fig. 8). The structure was at least 8.5 m long, delineated by four walls (only three were excavated: W2061–W2063). A rectangular pillar base, which probably supported the roof, was found near the center of the structure, and a rounded depression was found cut in the bedrock adjacent to the northern wall (W2061). The structure was located at the southwestern edge of a farmstead established by Jews on the crest of the mound during the first century CE, prior to the First Jewish Revolt, and was deserted shortly after the Second Revolt (the Bar Kokhba Revolt) in the second century CE. The finds, namely Galilean cooking bowls, jars and oil lamps, along with several fragments of chalk vessels, point to this date. This date is corroborated by three coins from the first to the early second centuries CE. This type of early synagogue is quite rare in Israel; its discovery in a small site like Tel Rekhesh is thus of great importance. The synagogue is not oriented toward Jerusalem, a trait common to synagogues from before the Bar Kokhba Revolt. The general shape of the synagogue may have equivalents at sites like Migdal, Qiryat Sefer and Gamla. It was probably erected because of the distance between Tel Rekhesh and other contemporaneous synagogues in the vicinity. Thus, the synagogue sheds new light on our understanding of the religious and cultural life of the inhabitants of small settlements in the Lower Galilee during the period between the two Jewish revolts against Rome. Hasegawa S., Kuwabara H. and Paz Y. 2017. Tel Rekhesh – 2014. HA-ESI 129. Hasegawa S., Kuwabara H. and Paz Y. 2018. Tel Rekhesh – 2015. HA-ESI 130. Kogan-Zehavi E. 2006. Tel Ashdod. HA-ESI 118. 1. 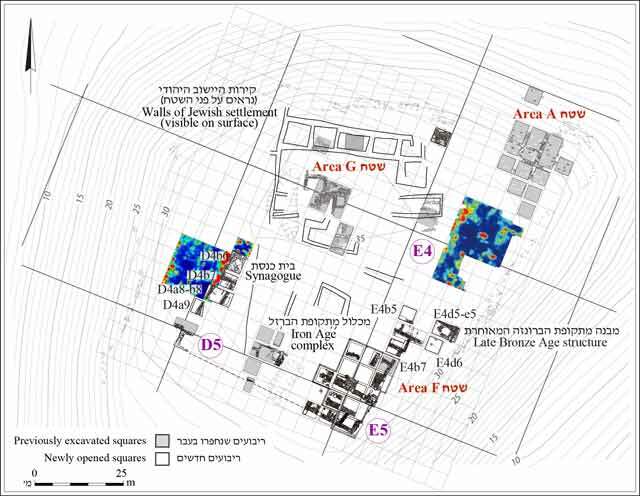 Tel Rekhesh, 2016: the excavated squares and the GPR survey areas. 2. Plan of the mound top. 3. The Late Bronze Age structure, looking south. 4. Basin 2556 (Sq E4d6), looking west. 5. A gold earring from the Late Bronze Age structure. 6. The excavated squares near the possible northeastern corner of the Iron Age IIC building complex, aerial view to the north. 7. The western enclosing walls (Sqs D4a8–D4b8), looking north. 8. The synagogue, looking west.